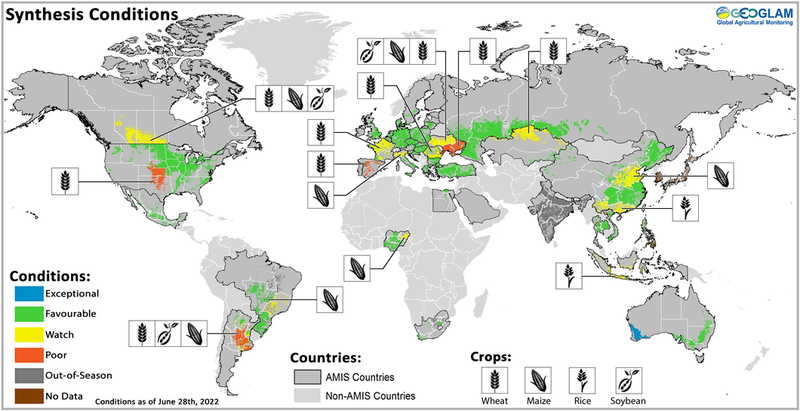 The crop condition map, kindly provided by the GEO Global Agricultural Monitoring initiative (GEOGLAM), synthesizes information for all four AMIS crops in major growing areas. Assessments are based on a combination of national and regional crop analyst inputs along with earth observation data. Crops that are in other than favourable conditions are displayed on the map with their crop symbol. Wheat - In the northern hemisphere, winter wheat is under favourable conditions with southern areas emerging from dormancy early in many places with above normal growth. Maize - In the southern hemisphere, conditions are favourable across most countries. Exceptional conditions are present at the start of harvest for early-planted maize in Argentina, while conditions remain mixed in South Africa at a crucial stage for final yield development. Rice – In China and India, conditions are favourable. In Southeast Asia, conditions are mixed in the northern countries for dry-season rice, with dry conditions in the Philippines and Thailand. Wet-season rice is advancing favourably in Indonesia. Soybeans - In the southern hemisphere, harvesting is ongoing in Brazil and Argentina under favourable conditions, with average to potentially above-average yields expected, respectively.